Personalized Name Guardians--Imagine the thrill of having your name, or a loved one's, immortalized and guarded by these two denizens of the macabre nations. Good for children's rooms or over the bar. Perfect for a band's logo--if you know of one who is a practitioner of the musical arts. Specify name of person, organization, or object you wish to name. Up to 14 letters (additional letters available at $2.00 per letter.) Custom logos or lettering also available. LARGE! 23" wide, 15" tall, 3" deep. Please contact the artist for the customizing information. Have your name immortalized and guarded by these creatures. If you would like this item, write me or call me. The Price is $88. I accept checks or money orders (I do not accept credit cards for security reasons). Make check or money order to Larry LoPresti. 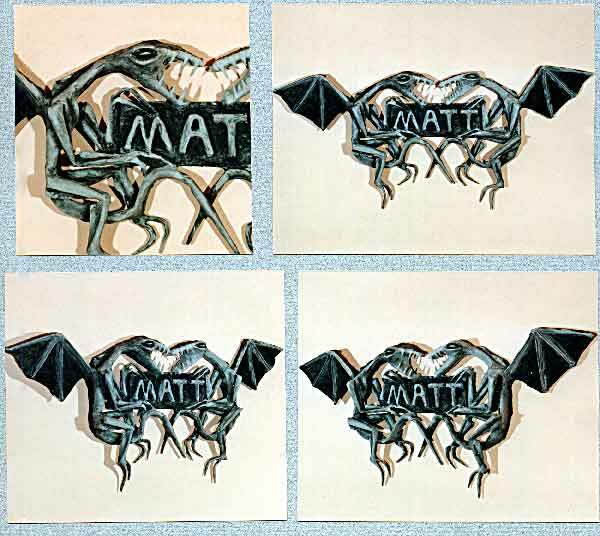 These WWW pages ©2002 LoPresti Gargoyles. All Rights Reserved.